Description: Sandhill cranes have long, dark legs, a long neck with a small head and long, straight beak, and a short tail with drooping feathers giving it a “bustled” look. They are light grey in colour with hints of rust and have a distinctive red crown on their head. They are 1.2 m (4 ft) tall with a 1.8-2.1 m (5.9-6.9 ft) wingspan and they can weigh up to 4.9 kg (10.8 lbs). Their windpipe is 1.5 m (4.9 ft) long and creates their trombone like call of “garooo-a-a”. Distribution and Habitat: Sandhill cranes are found throughout central and western North America (absent from northeastern North America), extending into Cuba and far northeastern Siberia. 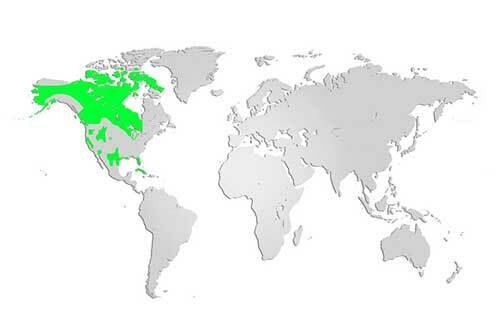 There are three migratory subspecies (Lesser, Greater and Canadian) found in parts of the northern United States and Canada as well as eastern Siberia, with wintering grounds in the southern United States and northern Mexico. Three other subspecies are non-migratory subspecies (Mississippi, Cuban, and Florida) and are found in the southern United States and Cuba. 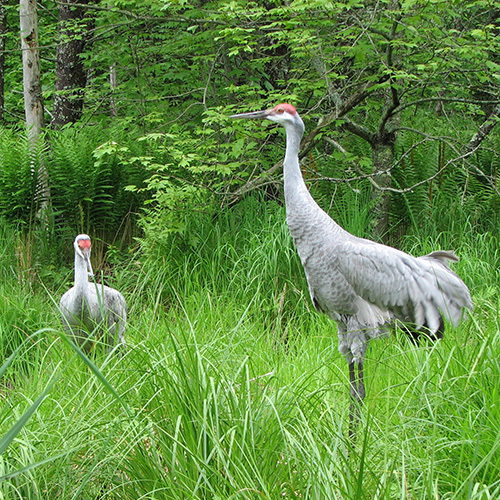 Sandhill cranes are primarily wetland birds nesting in marshes, bogs, or grasslands near ponds, lakes and rivers. Cranes will return to the same nesting area year after year. They will feed in grasslands and pastures during the day but prefer to near water and will return to a wet habitat for the night. Diet: Omnivores, the sandhill crane diet consists mostly of seeds and grains. They will also eat berries, leaves, roots, insects, snails, frogs, reptiles, small birds and mammals. Life Cycle: It takes several years for sandhill cranes to mature, but they usually mate for life and can live for up to 50 years. Both sexes defend their territory, incubate the eggs and defend their young. The pairs do a “dancing” display involving flapping their wings and bobbing their heads. They build a nest of vegetation on the ground and the female lays 1-3 eggs (usually 2). They are incubated for 29-32 days before they hatch. Young are covered with down and active (even able to swim hours after hatching) but they take about a year to become fully independent. Usually only one nestling is successfully raised by the pair per year. Did you know? A crane fossil from the Miocene Era, thought to be about ten million years old, was found in Nebraska. It is identical in structure to the modern Sandhill crane, making it one of the oldest bird species in the world! Between 1976 and 1983, there were several sightings of the sandhill crane in Nova Scotia.